The mutiny on the Bounty took place seventy years after Robinson Crusoe was published, but it has become one of the most well-known examples of sailors revolting against their officers. This work, written by the captain of the HMS Bounty, William Bligh, describes the mission to bring breadfruit plants from Tahiti to the English West Indies. Following the mutiny, Bligh managed to sail thousands of miles to Timor in the small ship in which he was cast away, eventually returning to England and being named Governor of Australia’s New South Wales. The present work has remained a popular story due to several film adaptations. In Robinson Crusoe, the mutiny of an English ship helps demonstrate the societal disorder that Crusoe has overcome by bringing order and civility to his isolated island. By assisting the deposed captain retake his ship, Crusoe makes possible his escape from the island and his return to European society. 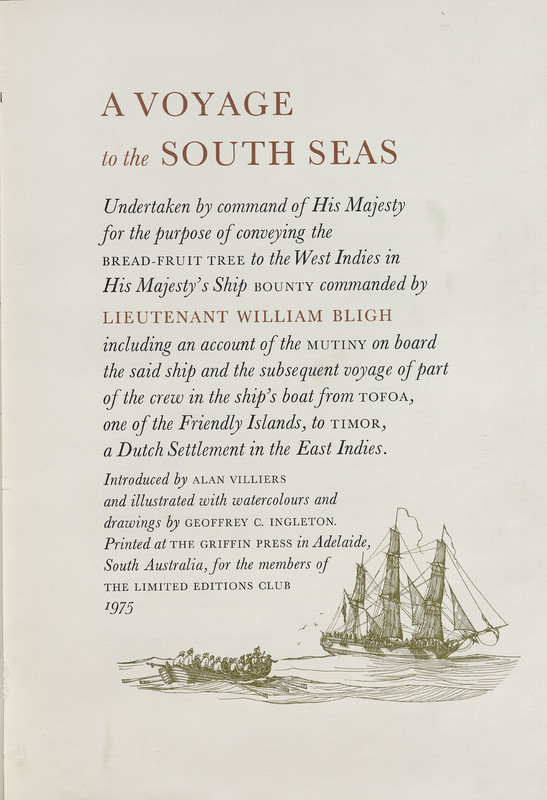 A Voyage to the South Seas: Undertaken by Command of His Majesty, for the Purpose of Conveying the Bread-Fruit Tree to the West Indies in His Majesty's Ship the Bounty Commanded by Lieutenant William Bligh Including an Account of the Mutiny on Board the Said Ship… Adelaide: The Griffin Press ... for members of The Limited Editions Club, 1975.